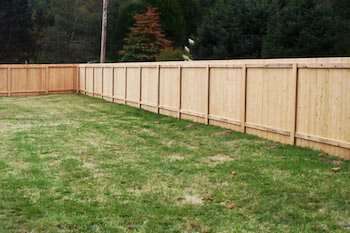 Dog Fencing Solutions | Pacific Fence & Wire Co.
Is there such a thing as dog-proof landscaping? A picture-perfect lawn may not be attainable with an energetic dog on the loose. But a safe yard – one that’s comfortable for both human and canine family members – is possible. A fenced-in yard is the perfect place for your best friend to romp and relax. Check out our list of fence types for dogs. Once your pet is contained with the right fence, there are lots of ways to make your landscaping dog-friendly. A fenced-in yard is the perfect place for your best friend to romp and relax. Is your dog a jumper, climber or digger? If your high-jumper clears the fence, you may need an inwardly slanting extension to keep it in. An extension also keeps climbers on the right side of the fence. Buried chicken wire or rebar prevents diggers from tunneling out. Some common landscaping plants, such as castor bean, are poisonous for dogs, so they should be removed from your yard. Avoid sharp plants that have thorns or spikes, as these can scratch a dog’s eyes. Some weeds and mushrooms are harmful. If you keep a compost pile, make sure your pet can’t get to it. Aside from the mess a dog can create in compost, some decomposers in the pile are toxic. The ASPCA has a list of plants that are dangerous for dogs. Consult this list when you’re buying new plants for your yard. Your local nursery can also help you choose safe plants. Has your dog beat a path in the yard? Dogs naturally patrol the perimeter of their territory. You can make the path official – and more attractive – with landscaping. Cover the trail with material that’s easy on paws. Rounded pebbles or cedar mulch may fit the bill. Border the path with wood planks or hard pavers. Plant areas along the path with low shrubs or border plants. Take steps to protect sensitive plants. A small fence, temporary or permanent, discourages dogs from trampling foliage. Place large landscaping rocks or decorative wood around planting beds. Raised beds can also establish a border. Once the off-limit area is clearly defined, teach your dog to stay out with boundary training. Training your dog to eliminate in one place will keep your yard cleaner. Choose a spot that’s comfortable for your pooch and easy to clean. Leave the area natural or cover it with a material you can hose off now and then. Flagstones, bricks or cement are simple to maintain. If your yard doesn’t have shady areas, you’ll need to make a place where your pet can cool down. 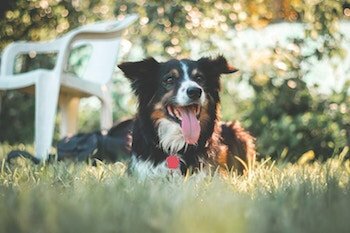 If your yard doesn’t have shady areas, you’ll need to make a place where your pet can cool down. Garden structures, such as an arbor or trellis, provide shade while dressing up the yard. Dogs often enjoy having their own pad, so consider adding a doghouse in a shady spot. When it’s time for your dog to come indoors, wipe their paws. Create a grooming station next to the entryway, keeping a washcloth and other grooming supplies handy so you can take care of muddy paws and dusty fur. A classic choice, a wooden fence is ideal for your dog run, especially if your dog tends to bark or growl at passers-by. If the wooden fence is solid (not slatted), it will block the street or neighbor’s yard from your dog’s sight and (hopefully) limit his noise-making. This is the best fence for dogs – that is, for those extra excitable pups who need a strong dog run fence that’s blocked off from people walking by. Additionally, wood fences can be quite tall, which can prevent your dog from jumping over the fence to explore the neighborhood. The most economical of fence choices, chain link fencing (also known as cyclone fences) is low-cost and low-maintenance, ideal for building a dog run enclosure. 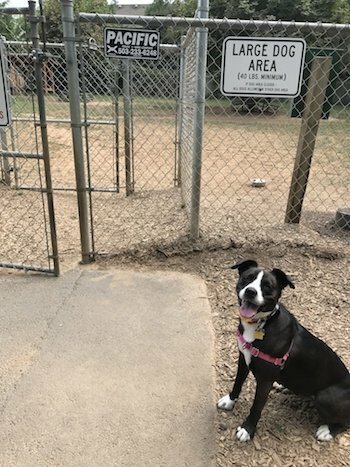 The most economical of fence choices, chain link fencing (also known as cyclone fences) is low-cost and low-maintenance, ideal for building a dog run enclosure. These types of fencing for dogs are easy to see through, so if you’re worried that your dog may be too loud, you can train vines or plants to obscure his view through the fence. For a quicker solution, you can always weave plastic or fabric strips through the chain link fence gaps to block the view from both sides. Another enclosure you can build with a cyclone fence for dogs is a chain link dog kennel. Unlike wood, vinyl will not split, twist, warp, rust, or rot. Because vinyl fences are so durable, many fence sellers can offer impressive warranties on their fences. Vinyl fences are 5 times stronger than wood and last significantly longer. Vinyl is also more flexible than wood, meaning it can take more weight and force, which is good if you have a larger dog breed who likes to jump. Cleaning is easy too—which is handy when your dog may be nosing around the fence or putting his paws on it. If you live in a muddy region, vinyl may be the best fence for dogs in the Pacific Northwest. Just a little soap and a hard spray of water will get dirt and mud off easily. For an extensive array of fences for any home or business, call or contact Pacific Fence & Wire toll-free at (800) 547-2410. Our experienced professionals can help you choose the best fence for your dogs, property and budget. With the right elements, a yard can be a haven for both you and your dog!